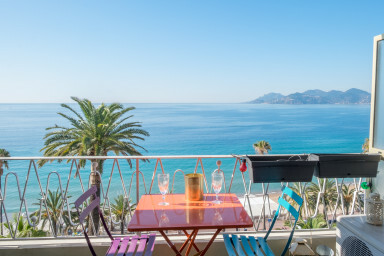 Located in the first line, directly on the beach (Plage du Midi) with a wonderful view of the beach, the Mediterranean and the Esterel mountains. The apartment is newly renovated and tastefully decorated and furnished. The apartment has two bedrooms, one with a double bed and a second bedroom with two single beds. From the bed in the first bedroom you have the most beautiful sea view! Living room with american kitchen and exit to the terrace that extends along the entire apartment. You have a dining table in the living room and also a small table and a nice sofa on the terrace. If you are looking for something special for your stay in Cannes then this apartment is for you. A second entrance that takes you directly onto the Plage du Midi where you will find a well-managed public beach and sections of the beach where you can rent a parasol, a mattress, etc. Meget bra beliggende leilighet. Passer bra for to. Varmtvannet i dusjen burde vært varmere. Godt utstyrt. Forholdsvis kostbart. Fin leilighet, med flott utsikt og sentral beliggenhet. Kommunikasjonen med "Destination Cannes" var utmerket i forkant av leieperioden, ved overtagelse og ved avslutning. UTMERKET.